CHICAGO, IL Force Head Coach John Konecki had some minor concerns that his team would come out a little rusty after a bye week. 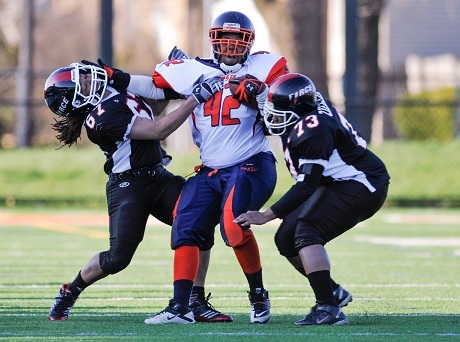 His worries were quickly forgotten as the Force dominated the Indy Crash 66-6 last Saturday on a frigid April afternoon in Evanston. “I had my juices flowing a little more than normal because I wasn’t sure that we would be firing on all cylinders,” explained the veteran coach. “I was very pleased with how we responded.” The Force wasted no time and on their opening possession utilized the talents of Darcy Leslie. In five plays, Leslie had her number called four times, including one long 30 yard scamper to the Crash 12 yard line. She followed her blockers going left, seven yards for the score, her first of four touchdowns on the day. The next set of possessions by both teams clearly seemed to be affected by the bone chilling cold. Jeanette Gray took a quick toss from Sami Grisafe at the Crash 40, and was finally tackled at the 29. Brandi Hatcher took a pitch from Grisafe and ran 23 yards to the Crash 6 and it appeared that another score was imminent. On the next play, Grisafe went under center, and just couldn’t wrap her hands around the ball as it squirted out and Indy recovered at their own six. Crash quarterback Lea Kaszas tried to hand off to Kiva Thomas, who coughed up the ball, recovered by Leslie, now on defense. The Force coaching staff rewarded Leslie as she ran it in to make the score 12-0. The Force defense continues to impress getting contributions from veterans and rookies. First year players Karlee Quaritsch and Melissa Nelson made their presence felt with timely tackling, and a fumble recovery by Nelson. Veteran “Taz” Brooks was her typical steady self and also recovered a fumble. Dorian Bridges ran down ball carriers all day long. Second year player Elisha Okrey, named defensive player of the game, seemed to be in on every tackle, and brings energy and excitement to her teammates. “Elisha has been working hard and everyone can see the results so far,” said defensive coordinator Adam Lewandowski. The Force will travel to St. Louis next week in the first of four straight road games. The next home game will be June first when they take on the rival Kansas City Tribe.